Love these cropped pants, polka dot top and flats. The longer work out pants and flip flops don't quite work. Sorry for the delayed post, we were up celebrating KU’s win last night (Rock Chalk) so we are moving slow this morning. We’ve decided to show how versatile a grandpa sweater is by showing 3 totally different looks. 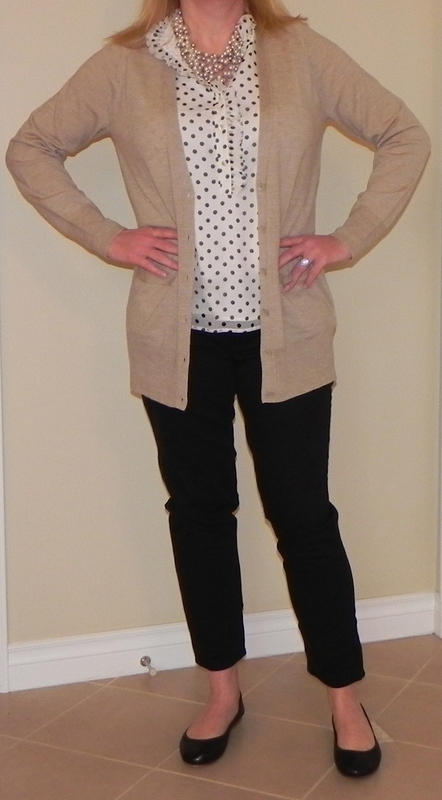 Erin has paired hers with cropped black pants, a cute polka dot blouse and a gorgeous necklace. Kara has chosen cropped skinny jeans, a silk blouse tucked in and has added a belt, bracelet and two necklaces. Her before is loose, faded baggy jeans, a plain white t shirt and birks just doesn’t have the same elegant look, does it? I’ve chosen a black pencil skirt, a polka dot top and a pink cardigan. I’ve added a pink belt and have selected these cute espadrille wedges. My before look of the plain white tank and baggy pants is unflattering and too messy. I am so jealous of these gorgeous snakeskin wedge heels. These baggy faded jeans are way too long for her. I love the pink and black together. It's a good combo for spring. These baggy pants are not flattering and the plain white tank is also making me look large in the tummy area. Let me be totally honest, since it is snowing again here today- we will not be wearing any of these outfits- instead we will be bundled head to toe in the warmest things we can find. UGH! Spring- please come soon. We miss you! Don’t forget to vote for Top Mommy Blogs- I need your vote each day (thank you!). Now, go drink some green beer! And, if you’re feeling really festive, try a green blazer! Isn’t this cute? This jacket is from Talbots, isn't it cute? You’re all adorable! Love the looks!